Time: 7:10pm. Age restrictions: All Ages. Time: 1:50pm. Age restrictions: All Ages. Time: 12:00pm. Admission: 12€. Age restrictions: No Minors. Showtime 22:00-03:00 on both nights. Time: 6:00pm. Admission: 0€. Age restrictions: All Ages. Address: Kirkkokatu 4. Time: 5:00pm. Age restrictions: No Minors. 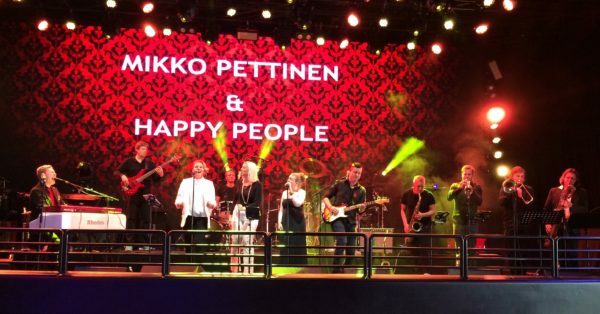 Mikko Pettinen & Happy Peoplen konsertti Flame Jazz Cruisella MS/Viking Gracen Voguessa. Mukana koko 11-henkinen soul ensemble! Time: 9:00pm. Age restrictions: No Minors. A club gig in Den Haag, Netherlands. More info TBA. Time: 7:00pm. Admission: TBA. Age restrictions: No Minors. Address: Valtakatu 39. Time: 9:00pm. Admission: free. Age restrictions: No Minors. Address: Säästöpankinranta 6. Time: 12:30pm. Admission: 37,50€/40€. Age restrictions: All Ages. Time: 7:00pm. Admission: 33/27/10€. Age restrictions: No Minors. Time: 9:00pm. Age restrictions: All Ages. Address: Tullikamarinaukio 2. Time: 4:15pm. Age restrictions: All Ages. Time: 8:00pm. Age restrictions: No Minors. Address: Ylä-Kolintie 39. Koli Jazz 2017: Happy Combo & TriSis plays music from the new album Nothing Can Stop My Spirit and some favourites from the debut album 2Happy. Soul and funk with some jazz, neosoul and gospel flavors. Soulin ja funkin ilosanomaa jazz-, neosoul- ja gospelsävyin. Time: 7:00pm. Age restrictions: All Ages. Address: Hämeentie 68. Nothing Can Stop My Spirit -albumin (cd, cd+dvd, LP) julkaisukonsertti. Mukana koko 11-henkinen Happy People. Soul- ja funkmusiikin riemua ja juhlaa jazzmaustein. Time: 8:00pm. Age restrictions: No Minors. Happy People Combon keikka Ravintola Kolmessa lyhdyssä.